Starting Thursday night, a second test of the aesthetic lighting on the Tilikum Crossing, Bridge of the People will take place. It will test the full spectrum of colors and the subtle motion that will change with the seasons and the activity of the Willamette River. On Thursday through Saturday, testing of the full aesthetic lighting system will take place from approximately 6 p.m. to midnight. Some initial testing of the lighting on the landside abutments and tower pylons will occur on Wednesday night. The aesthetic lighting was created by artists Douglas Hollis and the late Anna Valentina Murch for the Portland-Milwaukie Light Rail Transit Project’s Public Art Program. The public can view the lights from both sides of the Willamette River near the bridge, with easy access at SE Caruthers Plaza on the east bank of the river. In October, the first test of the 178 LED lights focused on light placement on the 40 bridge cables, the four tower pylons above and below the deck, and the two landside abutments. The December test will allow the artist to fine tune the lighting program that translates the seasons into subtle color and motion changes based on the natural conditions of the Willamette River. Once the commissioning of the lights is complete, the lights will be turned off until September 2015. 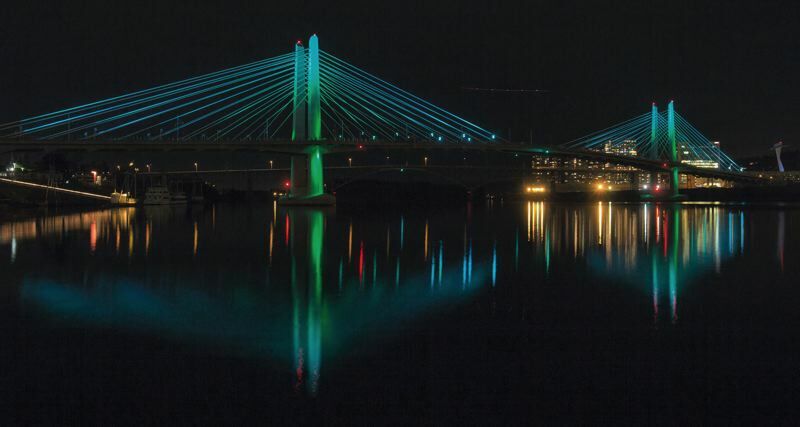 The lighting system will change colors according to data streamed from a U.S. Geological Service river monitor near the Morrison Bridge. The lighting effects will change based on the river’s speed, height and water temperature. Lighting programmer Morgan Barnard designed specialized software that reads the data from the river and translates it into the movement of color and light across the bridge.